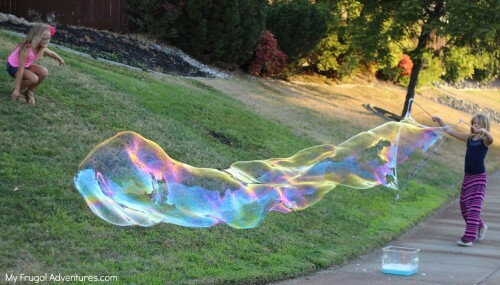 This giant bubble wand is something I have oohed and aahed over many times in the past. 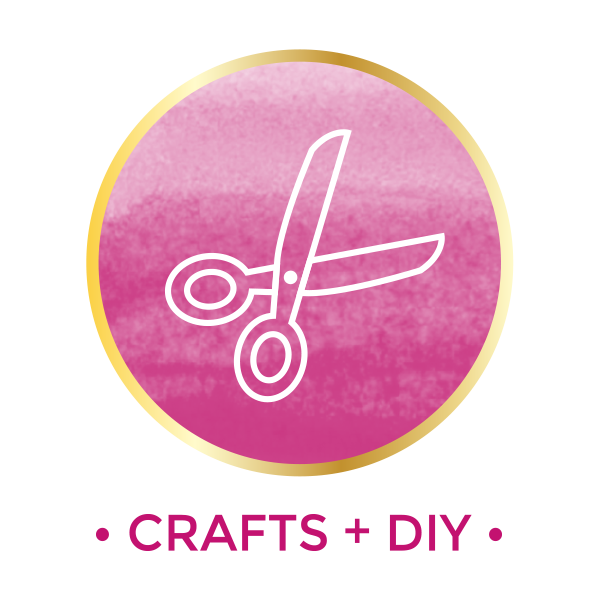 But to be honest when it comes to DIY or crafts if something seems overwhelmingly complicated or expensive- my eyes roll back into my head and my brain hits the mute button. You see my brain simply can’t handle complicated when it comes to homemade projects. I want easy peasy or no thank you. 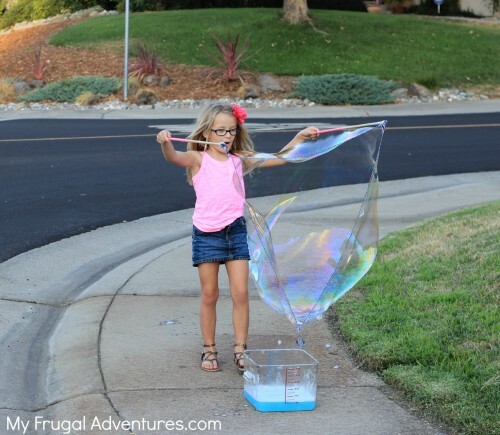 😉 I have seen tutorials for giant bubbles in the past that just seemed too hard to bother with or required buying wading pools and hoola hoops and other things I simply don’t want to buy and have cluttering up the house. So I have always just grabbed the bubble wands from the Dollar Store and called it a day. But we recently went to an outdoor festival and spotted a booth with a bucket and giant bubbles. The person manning the booth was sweet enough to walk me through the process of making these bubble wands and I can assure you it is so easy and so cheap! My 6 year old absolutely loves bubbles so several months ago I saw premade bubble wands at the craft stores and purchased them for about $4 or so as a birthday gift. Both of the brands we bought were complete junk and wound up getting tossed out. So I do suggest making these yourself if you can- it will be cheaper and most likely work better anyway. 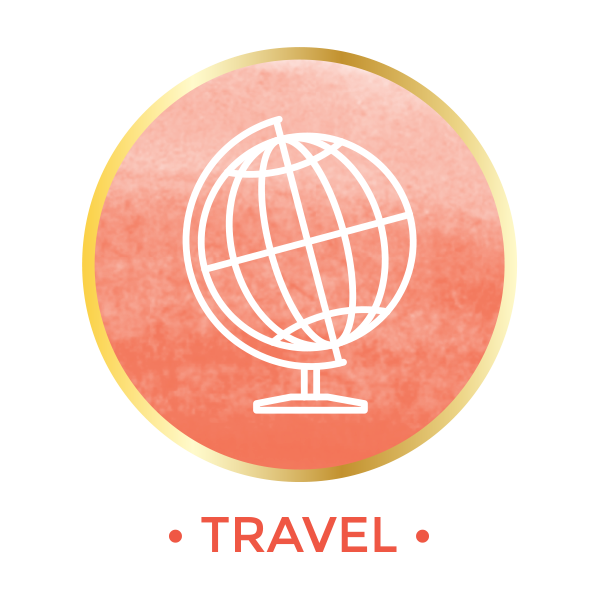 *Wooden Dowels (purchase this at the craft stores or home improvement store) – ours is a 3/8″ poplar dowel that was 48 inches long and I just cut it in half. (Home improvement stores will do that for you for free) You could just hunt for sticks that are the right size too but this dowel was only $1 at Home Depot. *String (I used baker’s twine) – try to find something like athicker string, not ribbon or yarn. Find this at craft stores or the Dollar section of Target. 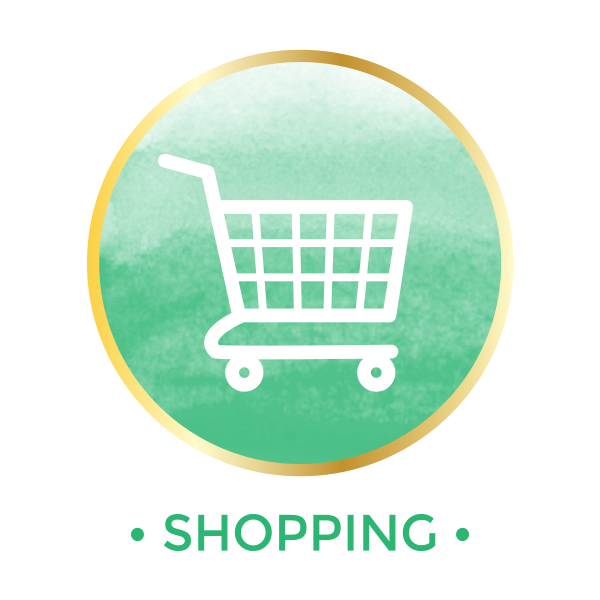 If you purchase everything you are probably looking at a $3 investment. I went ahead and painted my wooden dowels just to make them more fun but that is completely optional. You can also wrap washi tape or duct tape around the handles if you like. 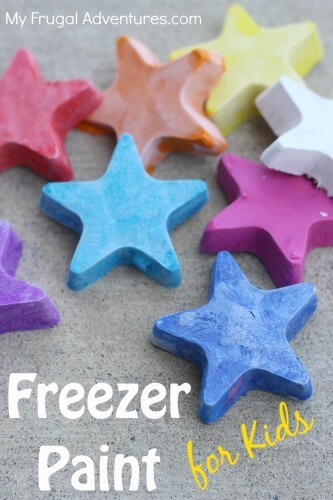 Painting is a good idea if you make these for each child to keep them straight. My big girl painted the sticks whilst I was making the bubble solution with my baby girl. To get started you want to drill a small hole in the end of your dowels or sticks to fit that screw eye in. You do not have to use these hooks but the wand will work a bit better with them. You can see above mine are already hooked in the top. 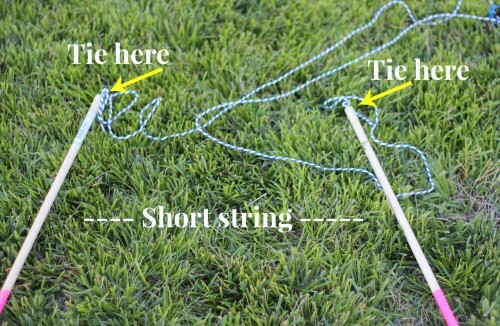 Now cut your string in two lengths. 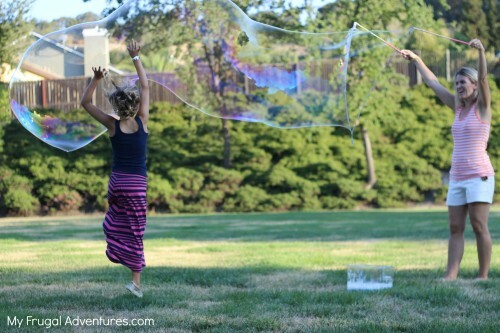 The length is completely up to you- you want it manageable for children but big enough to make large bubbles. The first string is going to be longer- I cut ours at about 80 inches. The second string is shorter- I cut ours at 37 inches. This does not have to be perfect, you want the second string to be roughly double the size of the first string. The wood dowels will be in each hand and the shorter string will be pulled taut. If you cut the string too long, your children might not be able to hold it taut. This size was manageable for my 6 year old and 7 year old to handle. If Dad was the one in charge of the bubble wand I might have cut the string longer to get even bigger bubbles. Now that you have two dowels with hooks on the end, and one short string and one long string, take the short string and tie each end onto the hooks on your dowels. If you don’t want to bother with the screws on the end, you can tie the string to the dowels directly and that might work OK. 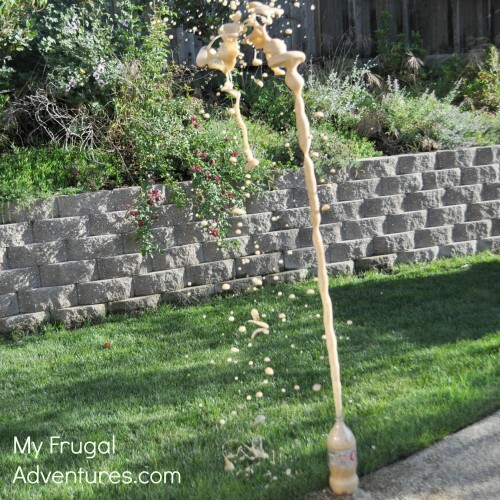 I would probably add a dab of hot glue to your knots directly on the wooden dowel just to hold it in place when you dunk in the bubble solution. For just a few cents though I think the eye screws are worth grabbing to get the best possible results. You are nearly done but one last little tiny detail. The strings can get knotted up when you are using them so I went ahead and tied a quick knot where the washers hang in the center of the string to keep them in place. 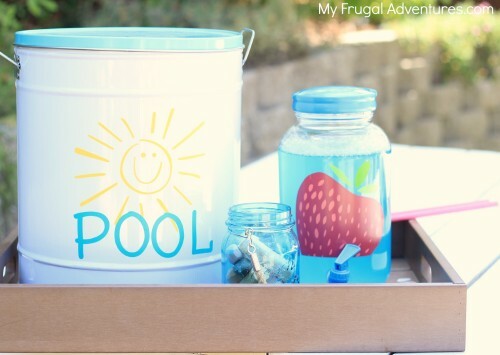 Now you will need a bucket or tub for your bubbles. Pick one up at the Dollar store or anything you have on hand- a roasting pan or storage tub or anything. It needs to be large enough to hold the bubble solution and dip the wand inside. 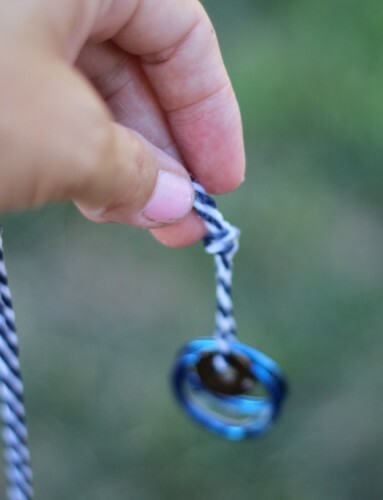 You don’t need anything huge here but I wouldn’t use- say a mason jar or tiny bowl for this part just because the string can get tangled up easily and I prefer to avoid that with something a bit larger to dunk in. 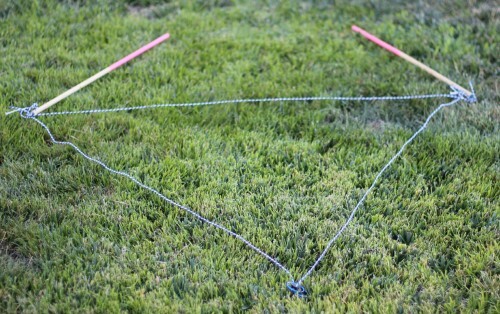 You simply dip the wand into the bubble solution, completely saturate the strings, gently pull the wand up with your short string held taut and the long string hanging loose as you see above in a triangle shape. The slower you move the better results you will get so this is a gentle thing. 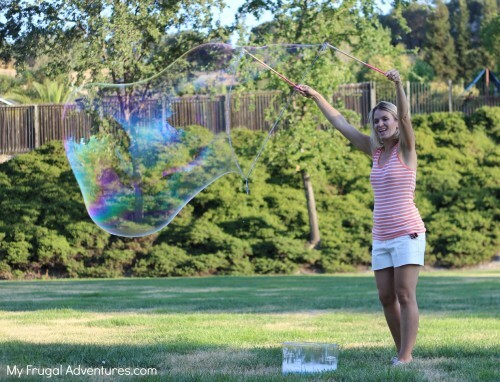 Walk backward or hold the strings and gently move your arms to the side to catch a small breeze and just wait until you see these giant bubbles! So much fun! This takes a second or two to get the hang of but that is my 6 year old above and she actually made amazing bubbles right off the start. 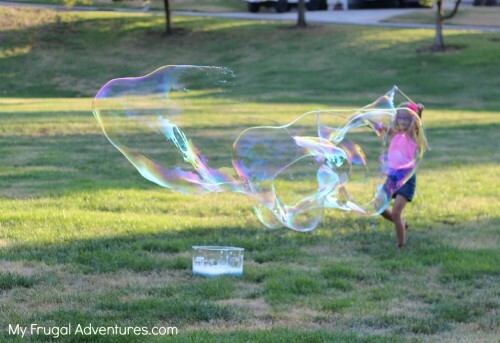 My 7 year old was trying to do big jumps and spins with the wand and the bubbles would pop too quickly so it took her a few tries to get the hang of it. Big sister takes a turn. 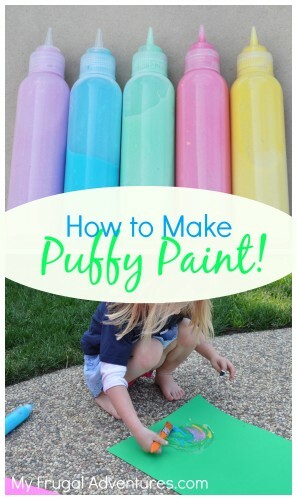 This is really a must do if you have small children because it is so simple and so much fun! Perfect for parties or camping or travelling. 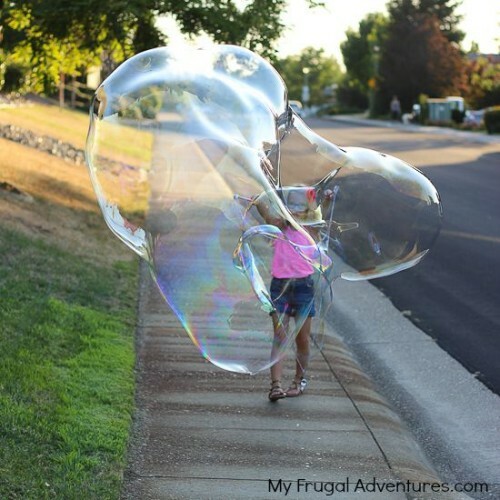 I am always trying to think of things that are portable and easy and this just doesn’t get any easier and the bubbles are SO cool to look at for the person making them. And now let’s talk bubbles. 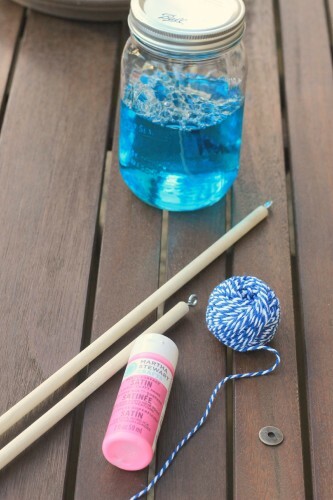 I personally am a fan of homemade bubbles. 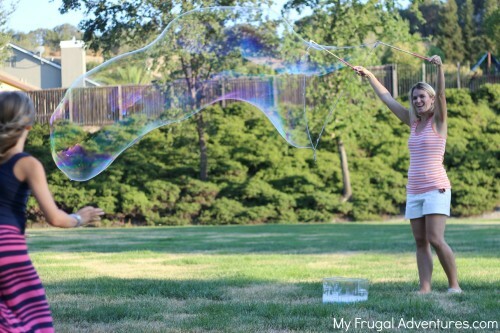 It is actually super easy to make bubbles and it just seems to work so much better than store bought. Embarrassingly enough, one more ingredient can make great bubbles. 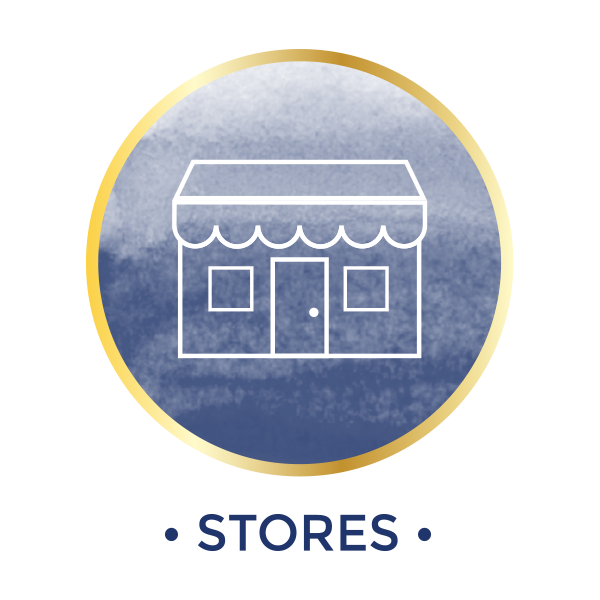 A personal lubricant such as KY Jelly works really well – you can find it anywhere including the dollar store. Obviously I don’t allow the kiddos to help with this step but just a teaspoon of this will make enough of a difference to warrant grabbing a bottle on your next Target run. And this solution worked wonderfully! We had a ton for our bubbles and then I just put the leftovers in a cheap, old drinking pitcher thing and it sits outside for the rest of summer. Homemade bubbles get better with age 😉 so having this sit out is perfectly fine. 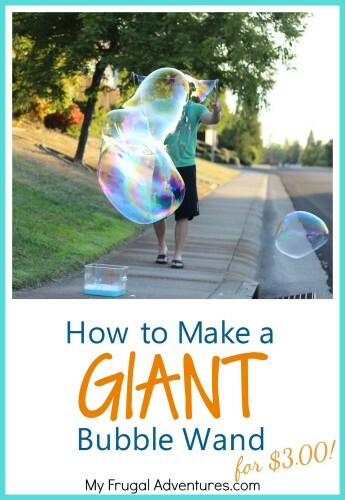 Immediately after you make bubbles the dish soap is frothy and so it is actually better after it settles a bit. We have our wands made and ready to go. We can’t find the original Dawn! Only Dawn Ultra! Where did you find yours? You mean you didn’t get any bubbles at all? I find that really surprising. How exactly did you mix the bubbles and what did you do after they were mixed together? How much KY jelly do I add to the mix?? Hi Lupe, I mentioned in the post to try about a teaspoon. You may need to add more but start with that 🙂 Good luck! 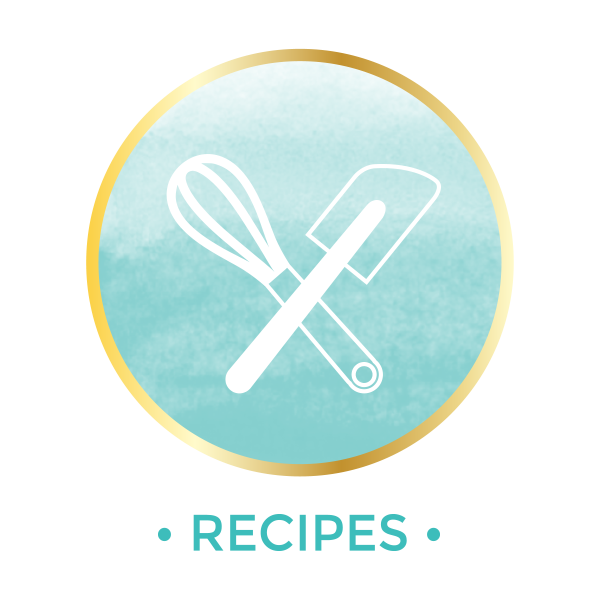 Can I substitute other kinds of twine for the bakers twine? Is it important that it’s cotton vs. synthetic?? You can also substitute Guar Gum (1 tap) in place of glycerin or lube. You can get guar gum in the gluten free section of the grocery store by Bob’s Red mill. I mix it with a little rubbing alcohol and mix it into the dish soap. It works GREAT!! Great tip Anna thank you! Why did you have to mix the guar gum with rubbing alcohol before to mix it to the dish soap? When you say it works GREAT, is this because it works better than glycerin? Cause we have some problem to find guar gum here.